St. Clairsville, OH (March 26, 2018) – The Belmont College Building Preservation/Restoration (BPR) Student Association will be hosting their fourth “Traditional Building Arts Expo” on Friday, April 6, 2018 in the Atrium at the Wheeling Artisan Center located in Downtown Wheeling from 5:00 to 8:00 p.m. There is no cost to attend the Expo. 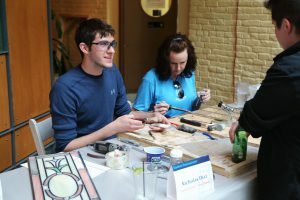 Student display from the 2017 BPR Traditional Building Arts Expo; BPR students Derrick Weber (left) and Billie Taylor working on stained glass. The community is invited to view student projects and demonstrations by talented BPR students who are learning the skills of the traditional building trades to preserve, maintain, and restore historic buildings. Examples of ornamental plaster, wood parquetry, stained glass, blacksmithing, hand-made ceramic tile and scagliola all made by students in the program will be displayed. Additionally, the students will also be offering some of their hand-made wares via a Chinese auction during the event. You must be present to win. All of the proceeds from the Chinese auction will benefit the BPR Student Association for conferences and field trips. For more information, please contact Professor Dave Mertz, BPR Program Chair, at 740.695-9500 ext. 4002 or dmertz@belmontcollege.edu.